First cohort of UTSA fellows attend a summer workshop. (Aug. 8, 2017) - For nearly a year, the first cohort of 12 fellows in The University of Texas at San Antonio Mellon Humanities Pathways Program have been working on their research skills and preparing for future graduate studies in the humanities. The program, primarily housed in the UTSA Mexico Center and the College of Liberal and Fine Arts, provides apprenticeships for undergraduates to pursue research in literature, art, music, history, communications, anthropology, sociology, philosophy, and other humanities fields. Fellows worked closely with UTSA’s top-tier faculty mentors, who taught them about the research process. Students used the skills they learned during those apprenticeships, seminars and workshops to present their research at academic conferences in Texas and around the country. “I am a first-generation student and don’t have role models in my family to help me navigate undergraduate and graduate studies, but through this program I found mentors at UTSA who are helping me become graduate school ready,” Gabriel Aguilar, Mellon Humanities Pathways Program fellow. Aguilar, a Brownsville native and senior English major with a concentration in professional writing, worked with Kenneth Walker, assistant professor in the UTSA Department of English, to choose his research focus. Aguilar is researching border cities and culture and plans to continue this research after graduating in May of 2018. 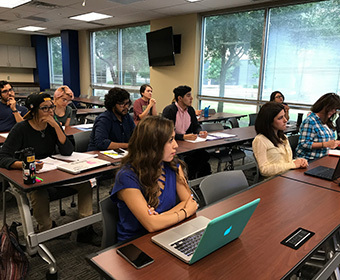 During a three-week summer workshop, hosted by the UTSA Mexico Center, Aguilar and the other fellows explored research related to the theme, “Latinos in a Changing World.” Students also learned about academic and research careers in the humanities and attended workshops focusing on academic skills and methodology used in humanities. Fellows also learned about requirements for graduate and doctoral programs, took a GRE prep course and even prepared some of their graduate school applications. As part of the workshop’s activities, the UTSA Mellon fellows networked with faculty and students from the Lozano Long Institute of Latin American Studies (LLILAS) and the Benson Latin American Collection at The University of Texas at Austin. The group also visited the San Antonio Museum of Art (SAMA) and talked to the museum’s curator of the Latin American art about possible career paths for Ph.Ds. in the humanities. Last fall, UTSA received a three-year, $500,000 grant from the prestigious Andrew W. Mellon Foundation to assist undergraduate students from underrepresented backgrounds in their research and in pursing graduate degrees in the humanities. Romo is the principal investigator for this grant. The UTSA Mellon Humanities Pathways program will provide 36 undergraduate students with exposure to humanities research methods, opportunities to participate in humanities research studies, professional development and mentoring that leads to doctoral studies in the humanities. The UTSA Mexico Center is currently accepting applications for the second cohort of Mellon Fellows for the 2017-2018 school year. The Mexico Center is looking for students with a commitment to pursuing graduate studies in the humanities. Fellows chosen for the training program will receive a stipend and a small research fund to complete their projects. Learn how to apply for the UTSA Mellon Humanities Pathways Program. Learn more about the UTSA Mexico Center. Explore opportunities with the UTSA College of Liberal and Fine Arts.